Announcing the Launch of new TSIA Benchmark Survey! You asked for it, and now it is here! The TSIA support services and field service benchmark surveys have gone through a complete overhaul, with a new online survey tool that is easy and intuitive to use, new survey questions including incident cost and fully burdened hourly rates for Level 1/2/3, and other information you asked for–100+ new questions in all. A huge thank you for a job well done to my team mate, Michael Israel, for steering this behemoth project safely to the dock. The project has passed through a number of hands, including mine, before Michael dedicated time to collect all the input, do the survey rewrite, implement the survey in a new tool, and launch it to members. The ability to logon, log off, and log back on again later and resume the survey where you left off. Multiple user logins, which allows different people in an organization to complete those portions of the survey with which they are most familiar. Built-in “skip logic” automatically “hides” those questions in the survey that are not relevant to the survey respondent based on answers he or she provided to earlier questions. Detailed explanations and instructions tied to the questions eliminate different interpretations of the questions, thus ensuring consistency in the answers. Service & support revenue and growth, margins, cost center vs. profit center, service revenue allocations, SaaS/Cloud revenue allocations to service, etc. Quality programs, direct vs. outsourced employee data, call handling statistics, service incident response & resolution times, multiple support channel data (phone, email, web portal, chat, social media, etc), priorities & types of incidents, support rep labor rates, costs per service incident, customer/support rep ratios, much more. assignment & dispatch methods, response & resolution times, first visit fix rates, call back rates, SLA compliance, remote diagnostics & remote problem resolution data, training, multi-vendor services, field service labor rates, costs per field service incident, more. 1st pass fill rates, backorder rates, call backs due to lack of parts, spares inventory values as a % of revenue, inventory variances to book values, parts used per incident, parts $ per incident, DOA & NTF data, security measures, spares planning methods, outsourcing practices, end-of-life practices, more. Customer repairs, “walk-up” or “drop-off” repairs, field technician repairs, RMA processes, advance exchange practices, “new” vs. “equivalent to new” exchanges, 3rd party repair vendors, turn-around-times, not-economical-to-repair (NER) thresholds, repair technician labor rates, etc. Maintenance contract & warranty data, methods of pricing contracts, list vs. net pricing, contract pricing fees, T&M fees & per incident fees, initial contract attach rates, contract attach rates during/at end of warranty, contract sales compensation practices, warranty credit allocations, much, much more. Customer survey methods, survey completion stats, customer satisfaction scores, satisfaction data by support channel (phone, email, web portal, chat, etc. ), satisfaction by direct employee vs. outsourced employee, customer loyalty data, compensation based on customer satisfaction. For all you TSIA members, here’s your chance to add your data so we can begin collecting data for these new questions as quickly as possible. If you have any questions about the survey, let me know, and as always, thanks for reading! How do you translate content for Multi-Lingual Self-Service? I am working on a research report about multi-lingual support. 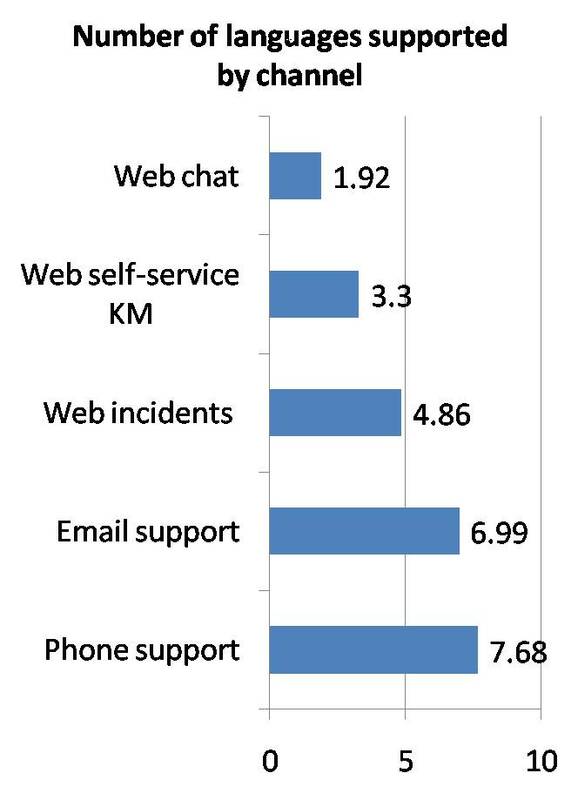 According to our benchmark, we are definitely seeing expanding support for Web self-service content beyond English, which not only tells global customers that you are invested in their region, but also can dramatically boost self-service adoption and success by allowing customers to browse content in their native language. Local geographic offices take English content and translate for local customers. An outsourcing translation service, such as LionBridge, translates your content. An auto-translation tool, such as Language Weaver, is used to automatically translate new content. Would you please weigh in on this polling question and let me know which approach–or another approach–you use? I will report back the findings, and it will really help me with this current research report! You are currently browsing the Ragsdale’s Eye on Service weblog archives for July 2010.